With today’s market volatility, many are asking why invest anyway? Returns are low. Economies are uncertain. I haven’t made any money in a decade. These are some of the complaints frequently mentioned by frustrated savers trying to plan for their future. So, what’s the answer? Why invest? To answer that question let’s go back to the building blocks of investing, and focus in particular on the real-return component of an investment’s return. Saving (investing) is essentially deferred consumption. By not spending $100 on groceries today, a saver can funnel that money to another use, in anticipation of getting back the money, plus a return, to buy groceries (or something else) sometime in the future. Historically, equities have earned real returns above inflation in the 3-6% range. The return the saver would require is generally made up of two parts. The first part is simply compensation for inflation. If $100 of groceries is expected to cost $105 in the future, the saver will demand a return of $5 just to keep purchasing power whole. (The principle of maintaining purchasing power is a key component of the Leon Frazer investing style.) The second part represents compensation for using the saver’s money. This is the real return. Think of real return this way. You have $100 to save. In addition to inflation, how much do you want in return for letting someone use your money? The answer depends on two primary variables – how long your money is invested, and the risk it won’t be returned in full. 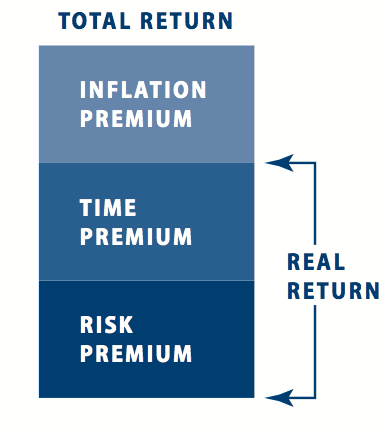 The time premium is generally easy – the longer the investment period, the higher the return. The risk premium reflects compensation for the possibility of not getting your money back. For example, governments are perceived to be safer than start-up corporations, so governments can borrow more cheaply than start-ups. Historically, equities have earned real returns above inflation in the 3-6% range. While changes in inflation have historically been the reason for market volatility (think of the ‘70s and ‘80s), changes in real returns can dramatically impact markets as well. In the Greek bond crisis of 2011-12, as fears of default grew, the Greek bond market collapsed as the real-return requirement to compensate for default risk went through the roof. Today, there is much discussion regarding whether all the easy money being printed by central banks will show up in inflation. While inflation risk is not to be dismissed, our concern is the negative impact of a rising real interest rate on investment returns. Over the past few weeks we have seen 10-year US Treasury yields go from 1.75 % to 2.25% with little change to inflationary expectations (generally thought of at 2%). In a negative real-return world, savers “give their money away” for perceived safety; the flood to the Treasury market in the post-crisis world was perfect evidence of give-away behaviour. That world appears to be over. The 0.5% increase in interest rates over the past month was a pure real-rate rise, and has impacted all markets, bonds and stocks alike. We continue to believe the best solution to negative real yields and to low market returns is a portfolio of quality, dividend-paying stocks. With an above-inflation current yield of 3%+, a Leon Frazer portfolio not only provides a superior income yield to government bonds, it affords the opportunity for income growth, the best offset for potential inflation. While no investment is risk free, we believe a dividend-focused portfolio offers the best investment solution in these turbulent times. Adapted from LFA Market Perspectives, June 2013.